As a fashion enthusiast, all my life I've been reading blogs and watching videos on youtube about people and style, and how they got some of their finest items from a second-hand shop. A couple of years ago I tried to go to the ones in Jakarta, even planned to check some in Bandung. I've heard some famous places for thrift shopping like Pasar Senen and Pasar baru. But after my initial visit, I don't think I'd go there again. I bought some pieces that I never worn up until this day. Sure they are super cheap—you can get anything less than a dollar. I shouldn't expect so much from used clothing but there's something about it that is just not right for me. I mean you can always wash the clothes and all but I've decided thrift shopping in Indonesia is just not for me. Living in Tokyo for roughly 5 months, I've had the best shopping, if not thrift-shopping experience. Unlike Jakarta, vintage shops in Tokyo are always well-decorated. They'd hang a deer head above the rack beside a wooden clock, or have their shop name written in neon lights. It gets better. The clothes are all curated. Meaning, they don't just throw away all clothes on the racks. They curate things that they think would fill your vintage needs. One rack is filled with vintage Levi's jacket available in all sizes, while the other rack gives you all the pattern you need on your midi skirts. Moreover, the shopkeepers are always well-dressed in vintage outfit as well, giving you an idea on what to buy in the store, if you haven't had one. The price, well, is most of the time more expensive than buying a piece of clothing from stores like H&M or Zara. Tokyo fashion appreciates vintage items so much that they put such high prices on them, sometimes unreasonably expensive. But it will never stop you from finding a nice tweed jacket or even vintage Versace briefcase. I think the most famous area for these kind of shops is Harajuku. After all the area itself is famous for Tokyo street fashion, having not only the used-clothing shops, but also the Japanese local brands, as well as high-fashion brands. It would definitely take you more than just a day trip to conquer the area. Another well known place is Shimo-kitazawa, which I first visited because a friend lived around the area. It's a lot quieter and less crowded than Harajuku, which gave me a more convenient shopping experience. Plus, there are a lot of cafes and coffee shops around to chill. The last one, which is by far my favorite, is actually an under-rated area for tourist. The name is Koenji. It's more like Shimo-kitazawa rather than Harajuku. I found a lot of smaller shops here which gave different vibes and styles of vintage. Looking at all the things below, I just realised that the time I had spent walking around the area was far longer than the actual things I bought. But let me say this briefly, even if you're not buying anything, or not even a fan of trendy vintage outfit, it's still a worth-it place to visit! As I've been talking so much about the experience, let me share some of the things I bought. The first thing ever I bought because I was way too excited seeing vintage shops in Tokyo, I just have to grab something. I think I got it from Flamingo in Harajuku, but this kind of hat can be found easily in any shop, really, I even found one in an actual store with the same price... LOL. But nothing beats the feeling of having something *VINTAGE* right? Right. I've only worn this hat once or twice, I think. Or three times tops. Which is why this is the only picture I have wearing it. Does it look good on me though? I brought three pair of shoes from home,—just because—but this pair is definitely the one I wear the most while I was in Tokyo. I had a pair of dr martens boots back home which is really uncomfortable for daily wear—seriously, I can never tell how do people manage walking in docmarts for hours? This pair, however, is so cozy! I can say that because I walked a lot and was able to survive with these shoes just fine. I love them ever since I laid my eyes on them. Plus, I don't think I had seen this type in store before,—I checked, they do sell it online though. Since they were still in excellent condition, I immediately took them home. Ever since I discovered vintage shops in Tokyo I've been dying to get me a colorful granny sweater/cardigan. And although they always have a whole section for these, it wasn't easy to find the one I want... oh my gosh I sound like a hopeless romantic only not for a guy, but a damn cardigan. I found this in a stack of clothes in a store called "Big Time" in Shimo-kitazawa. They also have another branch in Koenji. It's probably my favorite here, as it's beautifully decorated, and always playing The Chordettes everytime I came visit. It felt like I'm going shopping in the 50s, everything was just right to set the mood! Anyway, the cardigan was perfectly folded and I could only see a small part of it. I pulled it out and saw that the prettiest colors and pattern ever, so even when I checked the price and found out it was way unreasonable for an old knitwear, I still bought it. I have worn this countless times for the past few months that I swear my friends were already tired of seeing me in this hahah! When I was walking around Koenji, I stumbled upon a shop that sells a bunch of antiques. They sells vintage old lamps, teeth and eyeballs replica, and a lot of other things I wish I could bring home to add a little creepiness to my bedroom. I was interested in buying one of the vintage photographs, but on a second thought, I didn't think I want to keep a picture of a dead person who lived more than 50 years ago. So I picked this card because I like the pattern, and it happens to be my lucky number seven. Later when I got home I googled about the card. That's when I found out it was made by one of the most successful card company in Hungary back in the 40s-50s era. I couldn't believe I own something that is at least three times older than my age. Something about me and old stuffs. Big vintage shops in Tokyo (e.g: flamingo, big time, etc) always have this one big section of mid skirt, and most of them were tartan. The thing is they put such a high price on this kind of skirts. The cheaper could be around JPY5000. I was right about to give up and just planning to get one from an actual store. But then I found this one from New York Joe and the price was just right (for Tokyo, of course). It's in the perfect length and thickness for Tokyo winter. But I was never appropriately dressed for the weather anyway so nothing mattered really haha. I never wear rings at all. But since Tokyo fashion has so many nice silvers to offer, and I happened to stumble upon a hippie store that sells a lot of nice rings, I thought I just have to buy one. 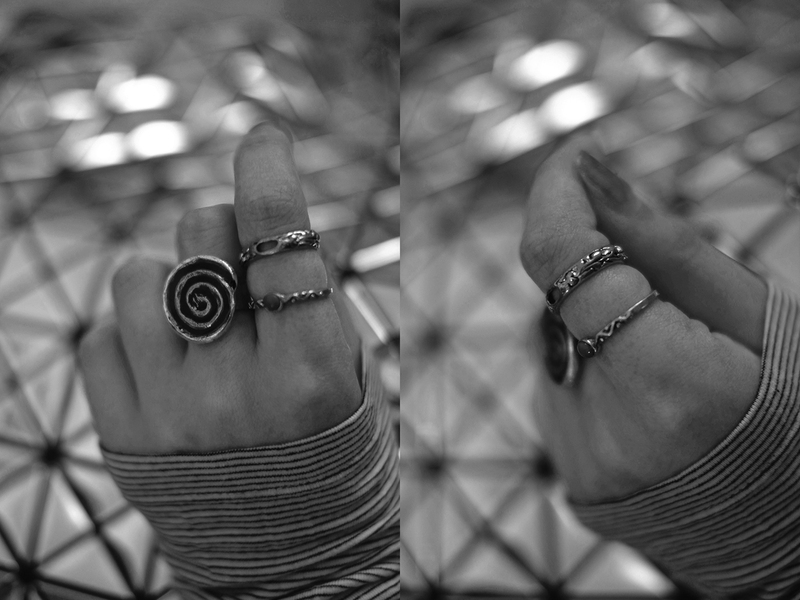 These three rings are the ones I always wear. I bought the one with the stone from a random hippie shop in Koenji. I remember it was only a hundred yen, which is equal to a dollar I think. I don't wanna buy anything too expensive since I still wasn't sure with how it would look on me. Then the big round ring, which my friend said kinda look like a time machine at some point, is from my favorite store Big Time. Silver rings are usually above JPY5000, or around that price. I got this one half price on winter sale, and was the happiest kid for the whole day. And the other one silver one—which I know you cannot tell because the picture is not clear, but it has a really beautiful carving on it—I got it from this one store (the one with the deer head on pictures above) on the street in Shimo-kitazawa. I bought it because I passed the store a lot and just fell in love every time, I just had to get something. Since the used cameras in that store were pretty expensive, I thought I'd add a ring to the collection to remember this very shop. Oh how I miss it already! Oh gosh, this post is making me miss Tokyo like crazy! So many cool shops there! The vintage market is so cool! Gorgeous pictures, it looks like so much fun! Omg what a fun experience, love your outfit! 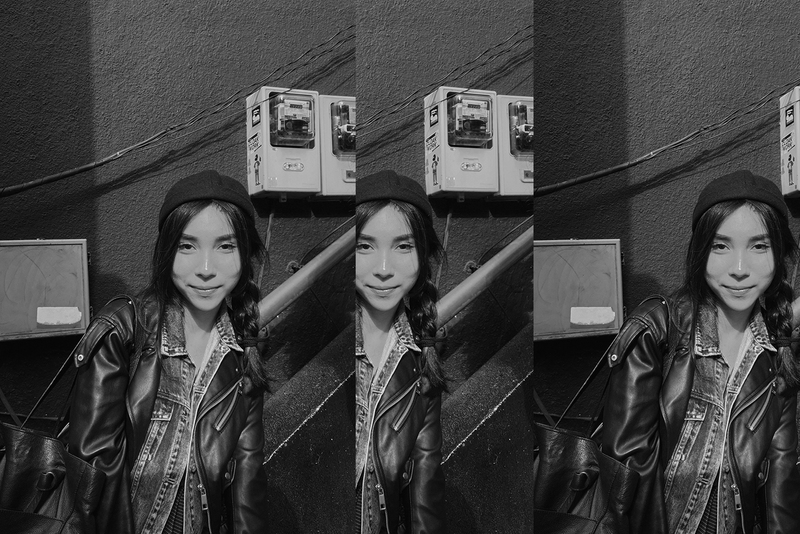 So great to live in Tokyo and your photos are so fun, really bring the experience to life. I would never think of Tokyo and and thrift stores together but how cool are these stores. And now I want me a colorful granny sweater! I looooove this post! Also, I really LOVE your blog, you are doing a great job. Keep publishing, dear! This is so cool, I'm dying to go to Tokyo, vintage shopping sounds so fun! Great post and photos as well! I love the vintage market! It so magical! What a fabulous experience and I love that sweater!! This vintage market looks lovely! Great pieces that you found! Wow, living in Tokyo has to be a crazy,amazing experience! Very interesting post and stunning photos, dear! Such an amazing tokyo experience. I like your style, hip and carefree. I've heard about deluxe vintage shops in Japan but it's nice that you also showcased here what you bought and that you've worn it. Top post! Wow, this vintage shop is a paradise! What an awesome shop! I love the vintage finds! Cute I love it all! I wish I could visit soon!